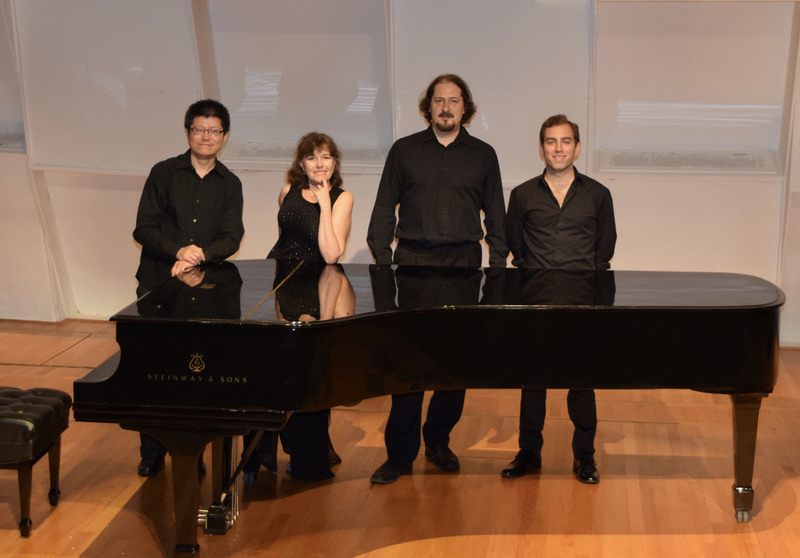 The ST. PETERSBURG PIANO QUARTET was founded in spring of 2014, making its début in New York City the same season with a pair of extremely successful concerts on the popular Barge Music series. Since then, they have performed nationwide, including the Da Camera Society in Los Angeles, Music Mountain, Flagler Museum in Palm Beach, Friends of Chamber Music of Troy, NY; Music at Kohl Mansion, and many other series. Alla Aranovskaya and Boris Vayner are the first violinist and violist of the St. Petersburg String Quartet, one of the world’s most esteemed chamber ensembles. The St. Petersburg String Quartet won 1st Prize at the All-Soviet Union String Quartet Competition, the Silver Medal and a Special Prize at the Tokyo International Chamber Music Competition, 1st Prize and both Special Prizes at the Vittorio Gui International Competition for Chamber Ensembles in Florence, Italy, and First Prize and the “Grand Prix Musica Viva” at the Melbourne, Australia International Chamber Music Competition.’’ They received a GRAMMY nomination and “Best Record” honors in Gramophone Magazine, held a five-year residency at the Oberlin Conservatory, and gave hundreds of concerts on many of North America, Europe and Asia’s most prestigious series and festivals. Pianist TAO LIN has been soloist with the Moscow Chamber Orchestra, Winnipeg Symphony, Miami Chamber Orchestra, and Knoxville Civic Orchestra. He has given recitals at the Kennedy Center, National Gallery, 92nd Street Y, Chautauqua Institute, Clarice Smith Performing Arts Center, Minnesota Orchestra Hall, Izumi Hall (Osaka, Japan), and Norway’s Grieg Museum. He was a founding member of both the Berlin Piano Quartet and the Brahms Piano Quartet. Tao won prizes at numerous competitions including the National Society of Arts and Letters, Music Teachers’ National Association, Palm Beach International Invitational, 1st International Piano e-Competition, William Kapell International Piano Competition and Osaka International Chamber Music Competition. Tao is an artist faculty member at the Bowdoin International Music Festival and visiting professor at Shanghai Normal University Music College, where he received the “Outstanding International Pedagogue” award. A Steinway artist, he has recorded for the Steinway, Naxos, Artek, Centaur, Romeo, Poinciana, and Piano Lovers labels. Cuban-American cellist THOMAS MESA won the $50,000 First Prize in the 2016 Sphinx Competition. He will perform as soloist with the Los Angeles Philharmonic at the Hollywood Bowl this summer, and recently played as soloist with the Cleveland Orchestra. Thomas won first place in the Thaviu Competition for String Performance in Chicago and the Alhambra Orchestra Concerto Competition. He received the Ray Millette Young Artists Award and the New World Symphony’s Outstanding Musicianship Award.